You can also call us and use your credit card. Judith Kerman is the editor/publisher of Mayapple Press. 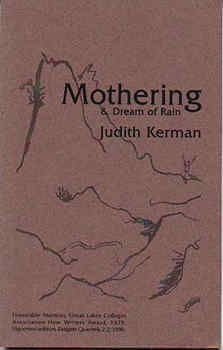 Her prose poem book, Mothering (Uroboros Books/Allegany Mountain Press, 1978) received Honorable Mention in the 1978 Great Lakes Colleges Association New Writers Award competition; it has been reissued with a companion play in Mothering & Dream of Rain (Ridgeway Press, 1996) and as a Storyspace ™ hypertext in Eastgate Quarterly Review of Hypertext 2.2.